In October, atomic scientists from around the world will gather in St. Petersburg for the I.A.E.A.’s annual conference on the use of fusion for energy. Atomic Energy Agency’s Fusion Energy Conference, which will be held on Oct. 13-18. This biannual conference serves as a key platform for international experts to meet and discuss new developments and possibilities for fusion energy. The first such conference was held in Salzburg, Austria, in 1961. Topics on the agenda for the 2014 conference include current prospects for further research in fusion energy. One subject at the top of the agenda is new innovative technological possibilities for using nuclear fusion as a source of energy. This year’s conference is expected to be attended by 1,000 delegates from 59 countries. Attendees will include scientists, officials and representatives of major energy corporations. In the mid-20th century, the world’s leading physicists began looking for new sources of energy in the process of nuclear fusion. They were inspired in their search by the sun. At the sun’s core, fusion reactions take place at temperatures of nearly 20 million degrees. These reactions release tremendous amounts of energy. Scientists in the Soviet Union were among the first to use this example to produce a controlled nuclear fusion reaction. Their work creating a reactor known as a tokamak later became the foundation of the International Thermonuclear Experimental Reactor (ITER), which is currently under construction in Cadarache, France. The creation of ITER was a long time in the making. In 1985, theoretical physicist Evgeny Velikhov, on behalf of the Soviet Union, invited scientists from Europe, the United States and Japan to jointly build a thermonuclear reactor. In 1986, an agreement was reached in Geneva on designing the facility, which later became known as ITER. In 1992, the partners signed a quadripartite agreement on developing an engineering project for the reactor. Construction began in 2011. The first phase of the construction is scheduled to be completed by 2018, with the first plasma expected to be produced in late 2019. In terms of radiation, a thermonuclear reactor is a far safer option than a nuclear reactor. To begin with, there are relatively few radioactive materials inside it. The energy that may be discharged as a result of an accident or a technical fault is also small and cannot destroy the reactor. Furthermore, the designers of the reactor envisage several natural barriers that would prevent the spread of radioactive materials. 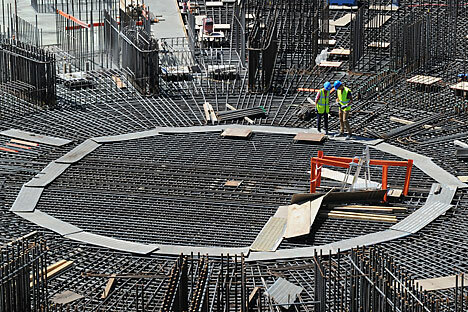 A test reactor is being built in France, about 35 miles from Marseille. Originally, the construction was set to be completed in 2016. However, gradually the the start of experiments was pushed back to 2020. The purpose of the experiment­al reactor is to demonstrate the scientific and technical possibility of producing fusion energy for peaceful purposes. The project is being implemented by China, the E.U., Japan, India, Russia, South Korea, the United States and Japan. Delegates to the St. Petersburg conference will have an opportunity to visit the institutes that conduct controlled nuclear fusion research and manufacture equipment for ITER as part of Russia’s obligations under the project. The conference is also expected to feature an exhibition of the ITER International Organization, with input from all the participating countries. Enterprises of Russia’s Rosatomstate nuclear corporation will present information on their participation in the project. Russia’s contribution consists of the production and delivery of high-tech equipment, including key units of the reactor. In late July 2014, one of these key reactor components underwent successful testing in Switzerland. The unit is a poloidal field conductor, an essential element of the reactor since it will create a magnetic field for holding the plasma together. The conductor was made jointly by Russian and European experts. The Russian side made the cable, while the Europeans put it in a steel casing. Under current agreements, Russia will continue to supply the conductors till 2017. In addition, in early June it was announced that Russia will produce and supply diagnostic systems for ITER, which will allow scientists to monitor plasma behavior inside the reactor. Overall, as part of its contribution to the ITER project, Russia is expected to produce nine of the 45 systems necessary to monitor the operation of the thermonuclear reactor.